« Herbs are Food…with a spark…to get you going! When we are not quite feeling ourselves, how many of us think, “oh the energy around here is really stagnant!”? …Right, very few. However, I am writing to teach you about the ancient art of smudging. This Sacred Ancient Act is believed to clear an environment of energy that may be stagnant or energy that is not conducive to your intentions for that space. It is especially important to smudge doorways because it helps to remove denser lingering energy that may have been left there. When we walk through a doorway we leave a little bit of what we were feeling in that space from our own energy field, which we refer to as our Aura. 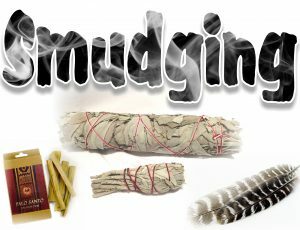 If you’re feeling depressed or stuck, maybe a little tired and sluggish, it’s a good time to consider smudging. All of these feelings are coming from and getting into your field from your emotional, spiritual and physical body and effected directly from your environment whether its home or at work. All of these aspects contribute to the stress we feel that leads to dis-harmony and dis-ease in the physical. There are many different tools for smudging. 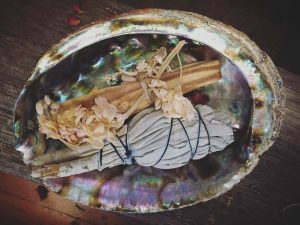 You can use sacred white sage sticks or loose, palo santo wood, bells, bowls, chimes, drums, toning, sweetgrass and even deertongue (it’s a plant). You’ll need a fireproof dish to hold under what you are burning – usually a Paua Abelone Shell. You can also incorporate a feather for spreading and circulating the smoke. So pick your tool and set your intention. It could be something as simple as saying, “I am clearing out any old thought patterns that may be blocking my path and desires.” “I am clearing any energy that is not conducive to what I am wanting in my life to move forward.” Make it yours. Make it as personal as you like. And always express gratitude for the cleansing. Light your sage or whatever you chose to use. Start at your entrance. Move in a clockwise direction so that you are going in the same way as the Universal energy so there is no resistance. You may want to say a little prayer to the 4 directions and begin. Ask for the removal and replace with your new intention. 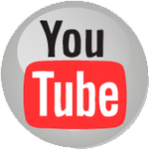 I also ask for assistance from my guides and anyone who may want to partake! My dad if its something big! Lol. It’s a way to a fresh start. You’ll get the most from this if you leave the space for even a short time and then come back and you will better notice the shift. You can also smudge yourself. We pick up a lot of stuff from people we come into contact with – we can usually feel it right away it just doesn’t register as being negative energy. If you’re an Empath, then you have a better chance of identifying when an energy is not serving your highest good. We all sense energy from others, we just don’t all realize it for what it is. The art of smudging is a sacred act utilized for thousands of years. Bringing in the Divine to a space will lift the energy and bring a more positive feeling to a space or a person. It should be done with the utmost respect for the plants and maybe the crystals you want to place around to raise the energy also. Be mindful to clear them also with the sage.